Sometimes life gets in the way of having a life. I hope our paths cross again soon for another look at the Silver Beatle. Atomic77 wrote: Hearing about your adventures and the ins and outs of the build are very enjoyable to say the least. Ditto here. Working through the "never did that before's" was half the fun of the build. Atomic77 wrote: I had tire issues initially. I went to passenger car radials. They have plenty of surplus load rating and are popularly priced. Atomic77 wrote: I too had a surprise when it came to weight. I figure I could save about 200# by going down one thickness on most plywood, and using a little less iron in the chassis. Hardly worth the effort of another build. I'll save it for that nebulous future standy. Hoping to find you out there camping, Michael. capnTelescope wrote: Who wants to use bleach water for their morning coffee? Anyone? Can I see a show of hands? Beuller? I thought so. I got a good chuckle out of this, and from your post in general, as always. Good to see an update. I haven't gotten to the point of doing any extended practical testing, but I do buy into the idea that portable/recyclable jugs/bottles are just more practical than onboard tanks and/or sinks in a TD. Bring them when you need them, leave them at home when you don't, no winterizing and easy to sanitize in the kitchen sink (where it is also easier to fully rinse the sanitizer out) if needed. She's a beaut! Glad you got something out of my wanderings. Thanks for the mention. KCStudly wrote: She's a beaut! Glad you got something out of my wanderings. Thanks for the mention. Great update. I'm just sorry I missed you when you were running around the desert up here. I'm just sorry I missed you when you were running around the desert up here. Ah'll be bach. You can be Beethoven. Hi Brad! Good to see your post on my build journal the other day. I just read thru your recent post-build post and I must say that people do learn building technics from reading other peoples' build journals but far more important is what we can learn from these post-build real road miles experience write-ups like yours. 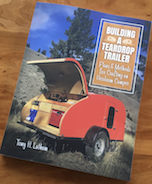 Too often people end their build journal with a nice set of pictures of their brand new pride and joy teardrop and then you never hear from them again. How are we to know if that great build idea they came up with didn't cause a wreck or at least heartache a year or two down the road. 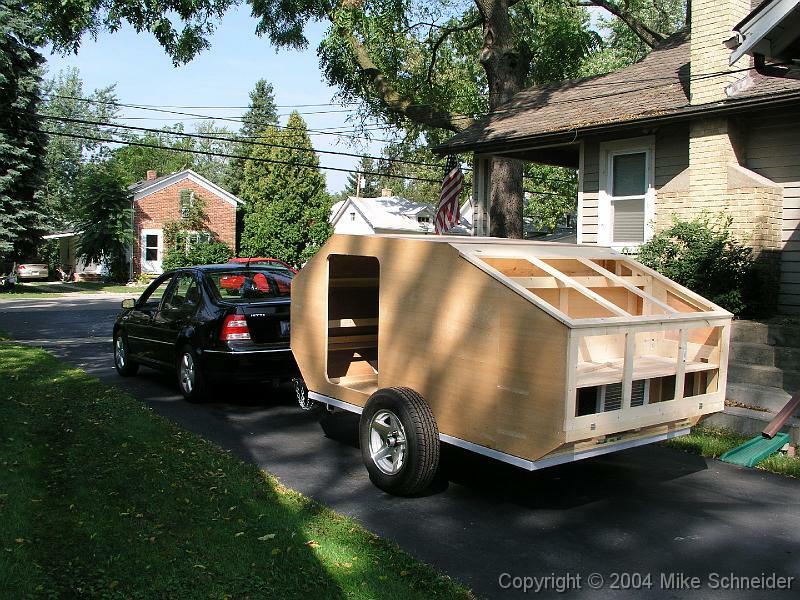 You may recall the considerable time and effort spent developing the hinge design for the hatch. That work has paid off handsomely. The hatch doesn't leak to this day. The B&B has been towed through and camped in plenty of rain and mud, and there has been no water intrusion into the galley. From above or below. The only complaint comes from the side gutters working as designed and splashing rainwater on one's feet while sitting in back under the easy-up. I'd also give the aluminum skin a bigger drip edge on the sides, just for peace of mind. After all the work that went into it, I keep the B&B garaged, even though the hatch works fine. The hatch isn't the only place where water can try to enter. Plus, the B&B uusually goes into "drydock" after a trip, for some attention to details. I should have knocked on wood. No sooner did I say "Success!," then I get a small leak. It's not the fault of the hatch design, it's got something (I don't have it figured out yet) to do with the hole I drilled through the top gutter to feed wire through for the backup camera. Since the backup camera also mysteriously quit working, I'll be looking for a solution that doesn't require a through hole and great gobs of caulking. Goes to prove the general rule of not having too many penetrations in the skin.